Campaign management allows you to manage your entire marketing process by which marketing campaigns are planned, produced, distributed and analyzed. This includes planning the campaign, preparing your mailing list, executing the campaign, measuring the campaign effectiveness, and analyzing the results. Being part of the business, Campaign Management should be in sync with the other business activities of an organization. It is always an advantage to maintain one platform where you can track marketing, sales and support activities. The built-in synchronization with Zoho Campaigns helps your customers to export leads and contacts from your Vertical CRM to Campaigns and easily plan & execute newsletters, welcome emails, customer surveys, etc. With this integration, Sales & Marketing can also track the responses from contacts and take better sales decisions while prospecting based on the response received. For example, if the response is "Clicked" on the links in email, you've better chances to promote the lead to prospect whereas if the response is "Marked as Spam" you could change the Lead Status as not interested. To enable this integration, users need an active account with any plan in Zoho Campaigns. Your customers must have active user license in Zoho Campaigns to configure the CRM sync settings. License for Zoho Campaigns can be purchased here . In your Vertical CRM, click Setup > Apps & Add ons > Zoho Apps > Campaigns Integration and click Enable. Sign in - If your customer already has an active user license in Zoho Campaigns, then this option can be used to sign in to their Zoho Campaigns account. Sign up - If your customer is new to Zoho and doesn't have an active Campaigns license, then the customer should sign up using this link. Once, your customer clicks sign in, they can sign in using their account which they have with Zoho Campaigns. Your customers can now start contact sync by opening Zoho Campaigns. Once, the integration is complete, your customers can start syncing contacts with their Zoho Campaigns account. In your Zoho Campaigns home page, click Sync CRM contacts. This will open the contacts page with the respective Vertical CRM already mapped inside. Click on Add new Sync which you see in the left corner, enter the Sync Details. Sync description - Provide a description for the sync. Module - Select the module from the vertical CRM that has to be synced with Zoho Campaigns. Mailing List - Select a mailing list from the available lists or select Add icon to create a new mailing list. Your Vertical CRM customers cannot access the email campaigns in Zoho Campaigns without an active user license. You can have 5 active syncs per day for the organization's account. In case you want to create another sync, please delete or disable an existing sync. Number of active sync allowed per organization is 15. This includes sync created by all users in an organization's Zoho Campaigns account. Number of contacts to be synced from your Vertical CRM depends on the plan limit in Zoho Campaigns. If a particular sync tries to import more than the allowed limit, the system will download only up to your plan limit. 'Update Campaign Member Status' is applicable only to contacts that were synced from Vertical CRM to Zoho Campaigns. The user must have permission to view the Campaigns module in Vertical CRM to track the email responses from Campaign Members. Your customers can send both Email Campaigns as well as Auto responders (Drip Marketing) to their contacts and leads from Zoho Campaigns. After executing email campaign from Zoho Campaigns, they can easily track different types of responses within the CRM's campaigns module. 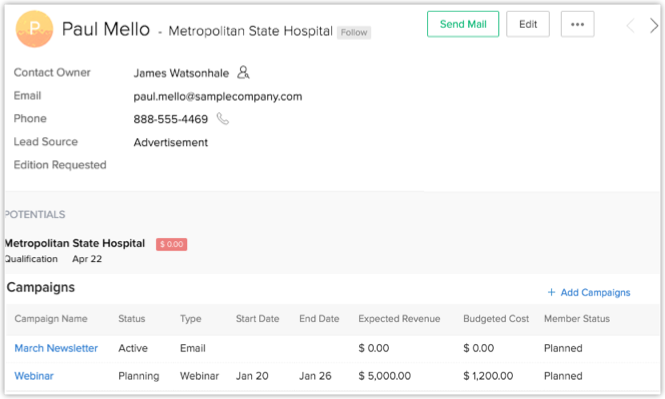 Your customers can drill-down the campaign members and view all status of the past email campaigns. In addition, they can view detailed stats of email campaign without logging into Campaigns. Bounced Email is bounced due to wrong email address of the campaign member. Unsubscribed The campaign member has unsubscribed from your mailing list. Next time, Zoho Campaigns will not send any mass emails. Log in to Zoho CRM. In the Campaigns Home page, select recently completed email campaign. In the Campaign page, track responses, view stats, and other details. Under Campaign Mail Details section, click the View button. Email template associated to the campaign will be opened in a new window. Your customers should log in to your Vertical CRM. Open a lead or contact. In the Lead Details page, under Campaigns related list, view the list of email campaigns. They cannot add new data from CRM to Campaigns but use the existing leads or contacts in Zoho Campaigns for future campaigns. Responses collected for the past email campaigns will not be deleted in your CRM. Your customers should log in to Zoho Campaigns with Administrator profile. Click Contacts > Sync Contacts > Existing Sync. Your existing sync settings will be removed.